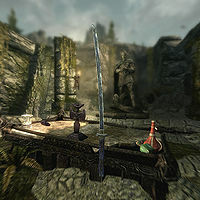 Bolar's Oathblade is the Akaviri katana of the expired Blade, Acilius Bolar. Its enchantment causes 25 points of stamina damage, as well as twelve points of fear for thirty seconds. Tempering this weapon requires one quicksilver ingot as well as the Arcane Blacksmith perk, with the improvements being doubled if you have the Steel Smithing perk. 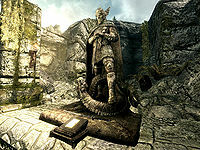 Bolar, being the sole survivor of the fall of Cloud Ruler Temple to the Thalmor, retreated to a shrine of Talos hidden inside Bloated Man's Grotto. However, the Thalmor eventually tracked him down to his resting place to continue the systematic eradication of the Blades. Choosing to defend this ancient site and die with honor, Acilius confronted them after leaving behind his last writ and this blade. The blade will not spawn during the hunt in Ill Met By Moonlight as the inside of Bloated Man's Grotto is completely altered. If you haven't retrieved the blade before starting the quest, the only way to get it is to kill Sinding and not enter the grotto for an ingame month. After that time period, the cave will reset to its pre-quest contents.